Concentrates are easy to use and have a great effect. The active ingredients are highly concentrated for an optimal and fast result. Apply the concentrate to cleansed skin or under a day cream / night cream. no animal testing, vegan herbal concentrate, which has a slightly blood flow and helps to refine large-pored skin. Valuable liposome concentrate with a high penetration- tendence for the care of oily, impure skin. Apply the concentrate on cleansed skin or under a day cream / night cream. no animal testing, vegan composition Concentrate with plant liposomes loaded with skin-active amino acids. 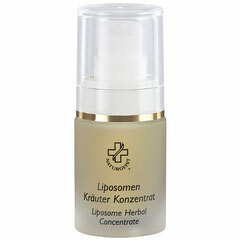 Valuable liposome concentrate with a high penetration- tendence for the care of demanding, mature skin. Without KVO-listed preservatives, PEG´s and mineral Oil. no animal testing, vegan sensitive concentrate with calming agents for the sensitive and irritated skin. Valuable liposome concentrate with a high penetration- tendence for the care of sensitive skin.